Learn more about the innovative approaches farmers are bringing to preserve the land, water, and surrounding wildlife habitats. Learn more about the San Luis & Delta-Mendota Water Authority, the Central Valley Project, and more. 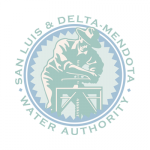 The San Luis & Delta-Mendota Water Authority Board of Directors is scheduled to meet on April 4, 2019 at 9:30 A.M. Please note that the Finance and Administration Committee Meeting scheduled for April 1, 2019 has been CANCELLED. Meeting materials for the next Finance and Administration Committee meeting will be posted here when available. The Grassland Basin Drainage Steering Committee is scheduled to meet on April 19, 2019 at 9:30 A.M.
Meeting materials for Operations and Maintenance Technical Committee will be available to download below. No Current Meeting Materials Available. Please note that the Regular Water Resources Committee Meeting scheduled for April 1, 2019 has been CANCELLED. Meeting materials for the next Water Resources Committee meeting will be posted below prior to the meeting.